How many times have you heard someone say "I've got to reduce my stress – I'm giving myself an ulcer?" Most of us take for granted the notion that stress and ulcers are irrefutably linked. In reality, there can be a relationship between stress and developing an ulcer. However, that relationship is less direct than one might think, according to Rakesh Gupta, M.D., gastroenterologist. Dr. Gupta recently discussed ulcers – their causes, symptoms and treatments -with HEALTH SCENE. "An ulcer can be most easily described as a kind of "hole in the wall," occurring in either the stomach, esophagus or duodenum, which is the first six inches of the small intestine. It resembles an open sore," Dr. Gupta says. abdominal pain, abdominal pain does not necessarily mean that you have an ulcer. At any given time about 2 percent to 3 percent of the population has ulcers. "For a basic, uncomplicated ulcer, a physical exam may appear normal, as may lab work. That's why endoscopy is a valuable tool in diagnosis. Through the gastroscope, passed down the esophagus and into the stomach, we can actually look for the ulcer, and confirm or refute it as the cause of the problem." Protective factors include the motility – the normal movement of foods through the digestive system - and the level of mucosal defense, made up of hormones that protect the stomach. Damaging factors include stomach acid, infection and reflux of small bowel juices into the stomach. Genetics affects both sides of the balance. In fact, genetic predisposition is thought to be the principle cause of ulcers in the majority of patients, Dr. Gupta says. 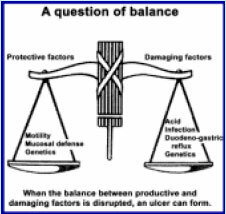 Upsetting the balance between protective and damaging factors can lead to an ulcer. For example, an excessive reflux of small bowel juices can cause the stomach itself to start digesting itself, thus causing an ulcer. As mentioned earlier, the presence of abdominal pain does not necessarily indicate an ulcer. Likewise, there are other symptoms that may be associated with an ulcer. These include chest pain, nausea or vomiting, anorexia or weight loss, dyspepsia or indigestion, GI bleeding and weight gain or increased appetite. 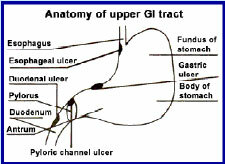 After the gastric ulcer is diagnosed, through the upper GI series or by viewing through a gastroscope, a biopsy is taken. Lest this sound alarming, Dr. Gupta says that 95 percent of uncomplicated ulcers are non cancerous. "Furthermore, if the ulcer is benign, it won't change into cancer later," Dr. Gupta says. "In case of recurrence, we may want to treat the ulcer more aggressively and follow with a prolonged maintenance treatment. Surgical treatment also might be appropriate for good risk patients," Dr. Gupta says. "Despite all the medications available, patients who are in poor general health will be less likely to be successful in healing their ulcers," Dr. Gupta adds. Overall, however, the trends in diagnosing and treating ulcers are encouraging. Although gastric ulcers are on the increase (due to more elderly, sicker people in the population), duodenal ulcers are decreasing in prevalence due in part to our abilities to manage stress better. 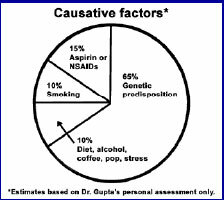 Carafate® - This prescription drug coats the ulcer, so that stomach acid can't touch it, and also increases the mucosal defenses. Cytotec® -This drug increases the production of certain hormones that bolster the mucosal defense. This is used for those on anti-arthritis medication. Prilosec® -The most powerful acid synthesis blocker, it shuts down acid production almost totally. "As a result, the ulcer heals very quickly – but there are concerns about its long-term safety," Dr. Gupta says. "Therefore, we use it as a short-term way in which to begin to heal the ulcer so that it will respond quickly to other medications. "It's no longer necessary to spend weeks in the hospital for most ulcers. Diagnosis and treatment are available on an outpatient basis, through services like Saint Anthony Hospital's GI laboratory," Dr. Gupta says. "The bottom line is, in most cases, an uncomplicated ulcer can be managed and treated while a normal lifestyle is maintained," he concludes.